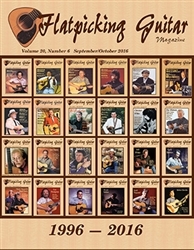 Welcome to the September/October 2016 addition of Flatpicking Guitar Magazine. This is Volume 20, Number 6 of the magazine and with this issue we not only finish Volume 20, but we bring Flatpicking Guitar Magazine to its conclusion. In this issue we continue with our Volume 20 theme of revisiting artists who have appeared on our cover in years past. Here we feature Scott Nygaard and Robert Bowlin. Also, all of our columnists are on board to provide one last lesson to you before we end publication. We hope you have enjoyed this magazine over the past 20 yeats as much as we all have enjoyed providing it for you.